Oh My Darling: One of the newest Downtown Syracuse restaurants, Oh My Darling and grab-and-go sister shop Clementine, are a must for your next workday lunch or night out! OMD features American Comfort classics, seasonal fare and craft cocktails, while Clementine offers salads, wraps and breakfast options. Try the Bacon Praline Pancakes and Aperol Spritz at Brunch and then come back and try the Rosemary Hot Honey Dipped Crispy Chicken for dinner! Water Street Bagel: We’re all about breakfast foods and you will be too at Water Street Bagels, a wood fired bagel shop with options galore. Choose one of their rotating flavors of bagels like French Toast or Rosemary Salt and add one of their made in-house cream cheeses like Honey Walnut or Bacon Horseradish. Not a cream cheese fanatic? Order up on of their classic breakfast sandwiches like the Power Up and start the morning off right. Habiba’s Ethiopian Kitchen: Treat your taste buds with something new to the Syracuse area, Ethiopian fare. Owner and Executive Chef, Habiba Boru, delivers classic dishes from her birthplace. Start off with a veggie sambusa then order up the Doro Beyaynetu (chicken) combo sampler to share. Be sure to save some time while there to chat with Habiba and hear more about her inspiring story. 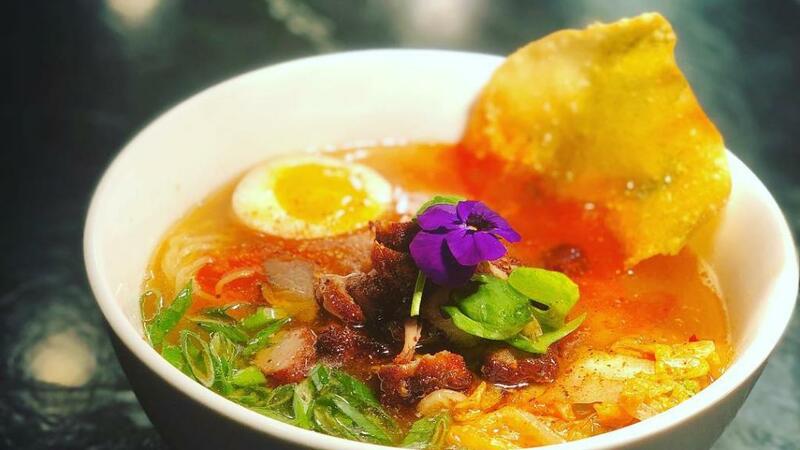 Kasai Ramen: More than just a ramen restaurant, this downtown spot serves up the traditional Japanese Ramen and Izakaya with some flair. The pork steam buns feature 24-hour marinated pork chashu, house kimchi and hoisin ghost sauce, while the shoyu ramen consists of both pork and chicken broth, soy tare, dashi, chashu pork roll, six minute egg, enoki mushroom and bok choy. Looking for something a bit more “Syracuse”? Try the Kimchi Salt Potato. Chef and the Cook: A one-of-a-kind culinary establishment, The Chef & The Cook uses fresh and sustainable ingredients in its variety of dishes. From classic recipes like Eggplant “Cannelloni” to new-age kitchen adventures like the Lamb “Ragu” and Ravioli, the three owners and chefs, DeAnna Germano, Mark Germano and Jason Jessmore look to offer dishes from both a cook and chefs point of view. The Cider Mill: The Taunton area restaurant has seen a few remodels since its opening in 2014, but one thing has stayed the same, fan favorite menu item Heavenly Thighs. Served with Split Rock Greens and Smoked Gouda Mac & Cheese these brown sugar and cinnamon-spice chicken thighs are a perfect twist on a classic chicken dinner. Make sure to save room for dessert with a spring menu featuring sweets such as Blueberry Buckle with Lemon Curd and Apple Cider Donuts. Vicino’s Brick & Brew: One of the newest brick oven pizza restaurants, Vicino’s, was inspired by four area neighbors and their love of hand tossed brick oven pizza and locally brewed craft beer. Their draft menu features beers from local breweries such as IBU, Full Boar and Seneca Street Brew Pub. Their signature pizza of chili infused honey, smoked gouda and pepperoni is everything a pizza should be! School & Vine: Opened in 2015, School & Vine Kitchen and Bar operates out of the former Southwood Two-Teacher Schoolhouse, originally built in 1937. You’ll leave dinner raving about everything from the starters to the desserts, and everything in between. Start off with some Chicken Lemongrass Dumplings then go light with an Apple Brie Chicken Salad or more substantial with the Lobster Ravioli or Pepperjack Bacon Jam Burger. Stay true to your light or heavy fare with the Caramel Chocolate Brownie Sundae dessert or the lighter Italian Lemon Cake.